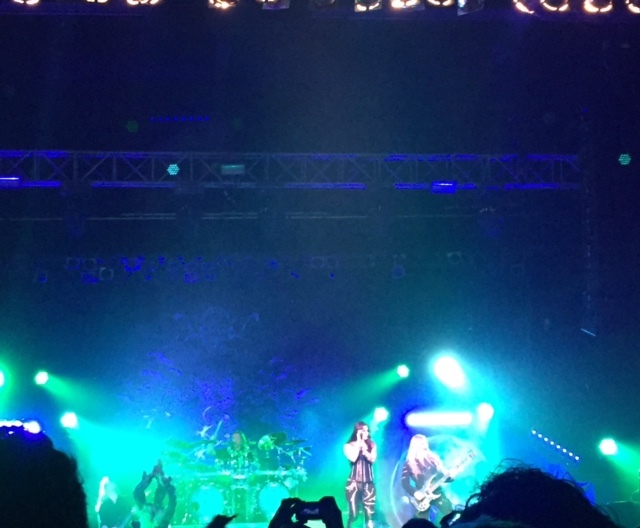 Since I was undoubtedly a huge fan of the new Nightwish album Endless Forms Most Beautiful, it only made sense for me to make sure I caught them live at the Electric Factory on the North American leg of the Endless Forms Most Beautiful tour. Throughout the week leading up to the Friday night concert, I could hardly contain my excitement. Having listened to Floor’s interpretations of older Nightwish songs on the recent live album Showtime, Storytime, I could hardly wait to see the band perform live. I had seen Nightwish in concert twice while they were touring for their previous album Imaginaerum (in Los Angeles at the Gibson my senior year of high school and in Philadelphia at the Electric Factory my freshman year of college), so I was particularly excited to see how the band would perform with their singer. Accompanied by longtime Nightwish fans Erika Cancio-Bello ’15 (who had seen them live in New York the night before) and Amanda Lee ’18, as well as new Nightwish enthusiast Anna Jensen ’17, I took the train to Jefferson Station (formerly known as Market East), and we set out on our way. After stopping at Tea-Do in Chinatown for smoothies and snacks, we arrived at the Electric Factory at 8:45 p.m., just as the first opening band, Delain, finished their set. After scoring plenty of overpriced Nightwish merchandise, we formed a snakelike chain and pushed through the oscillating crowd bit by bit. As the second opening band, the Swedish metallers Sabaton, prepared for their set, the crowd’s excitement was palpable. Indeed, as Sabaton came on and performed their roughly hour-long opening set, I could see why: while I wasn’t exactly a fan of the music, the band members had a charming stage presence and were clearly also excited to be in Philadelphia that night, opening for Nightwish. When Nightwish finally came on at around 10 p.m., heralded by Richard Dawkin’s opening lines from “Shudder Before the Beautiful” from Endless Forms, I — along with the rest of the standing-room only crowd — screamed for what was likely the first of several dozen times that night. The band members emerged from the darkness as light slowly engulfed the stage. The light quickly focused on Floor, who, over the course of the concert, proved to be incredibly energetic and charismatic, a marked improvement from the often awkward nervousness of her predecessor Anette. After finishing the night’s opener (also the opening track from the new album), the band segued into the heavy, harsh “Yours is an Empty Hope” from Endless Forms. The combination of Floor’s and bassist Marco Hietala’s vocals was breathtaking in its raw power and allowed Floor to show off her versatility early on with some growling vocals. Next the band played “Amaranth,” a catchy, pleasant, poppy song from the band’s sixth album, Dark Passion Play (2007), followed by the classic “She is My Sin” from the band’s 2000 album Wishmaster, a song more power metal than symphonic metal. After playing the title track from Endless Forms, which was an album highlight, the other new member of the band, Troy Donockley, came onto the stage for the “folk section” of the concert. This section included “My Walden” (Endless Forms) and “The Islander” (Dark Passion Play), a touching acoustic ballad with Marco on lead vocals that I am glad is now in permanent rotation on Nightwish’s concert setlist. Next came the first Endless Forms single, the whimsical, jaunty “Élan.” Then, things kicked back into gear with the brutal “Weak Fantasy” (Endless Forms), where once again Floor and Marco displayed their vocal compatibility. The band transitioned into the light-hearted single “Storytime” from Imaginaerum (2011), followed by their classic 2004 song “Nemo,” (Once), which wasn’t surprising, as it has probably been played at every Nightwish show since 2004. While it is a good song, I was slightly disappointed that they had chosen to play it, since it bears enough melodic similarity to “Élan” that they really could have played another classic, perhaps something from 2002’s Century Child (an album which went unrepresented during this concert). Next came “I Want My Tears Back,” (Imaginaerum), another song incorporating Troy’s folk elements (that really should have been placed earlier in the show along with “My Walden” and “Élan”). The true highlight of the show (barring the encore) was the two-song detour into Nightwish’s 1998 album Oceanborn, namely “Stargazers,” that album’s opener which was revived for this tour, and “Sleeping Sun.” Both of these songs found Floor using operatic vocals in the style of Tarja, the first Nightwish vocalist and the one who made those songs famous. The band then played their “last” official song for the night, parts 2 and 3 of the massively long Endless Forms closer, the appropriately titled “The Greatest Show on Earth,” followed by the band pretending to leave for the night. Since Nightwish had neglected to play an encore the last time I had seen them in Philadelphia, when they departed the stage, I was genuinely nervous. Was that it for the night? Within ten minutes, the band returned, and I recall screaming particularly loudly with intense happiness as I heard the first opening notes of the band’s ten-minute long masterpiece, “Ghost Love Score” (Once), which is apparently one of Floor’s favorite songs to perform. As far as encore songs went, I could hardly have asked for better. The band then finished with “Last Ride of the Day” (Imaginaerum) and left for good to thunderous applause. I sang along to every song, clapped my hands off, and likely damaged my vocal chords (already strained from a slight cold that night), but it was entirely worth it. Each band member was clearly in fine form for this show, with plenty of energy and a marked improvement of sound quality since the last time I’d seen them at this venue. Overall, though, Marco’s witticisms and guitarist Emppu Vuorinen’s adorable running around onstage was overshadowed by Floor’s magnetism. Whether she was crooning, growling, belting every note perfectly, or even headbanging between verses, she completely held everyone’s attention (or at least mine). Based on both the album Endless Forms Most Beautiful and this concert, Floor Jansen has proved to be an invigorating force for the rest of Nightwish, and I can only hope that she is here to stay. Featured image by Deborah Krieger ’16/The Daily Gazette. I’d never heard Sabaton before, but holy crap are they an entertaining live band! They got a ridiculously uproarious reception, and deservedly so. I saw Delain open for another band last year. They may not be as glamorous as Nightwish, but they are very consistent, I rather like them live (the previous time was a club, the intimate setting quite suits them). This is a perfect review. The show was great!